Matchmaking (MM) is a very important game mechanic which has to be clearly understandable to any player. Most players no doubt know about the limit on the +/- 1.0 BR variance of vehicles’ Battle Ratings when assembling teams. This means that when you prepare for the next battle, assemble a squad or return to a comfortable battle rank for you, you’re sure to pay attention to the BR of the vehicles in your selection. But far fewer players know about the existence of another matchmaking rule – rank limitations. This rule works like this: regardless of the resulting Battle Rating of an individual vehicle or a player’s lineup of vehicles, matchmaking is calculated for opponents whose top vehicle’s rank differs from the player’s highest vehicle’s rank by no more than one (either higher or lower). Complicated? On paper, sure. In reality, this rule activates very rarely, since even without it, the Battle Ratings of vehicles in most cases fall within the acceptable limitations of ranks. But there are individual examples of vehicles whose Battle Rating does not prevent an encounter between, for example, a vehicle at the lower end of rank three with a vehicle at the top end of rank one. At the same time, in spite of the seemingly large variance and the resulting concern that a vehicle at the top end of rank one won’t be able to take on a vehicle at the bottom end of rank three, in practice it all turns out differently and the vehicles would have comfortably fought with each other – if not for the limitation rule on ranks. 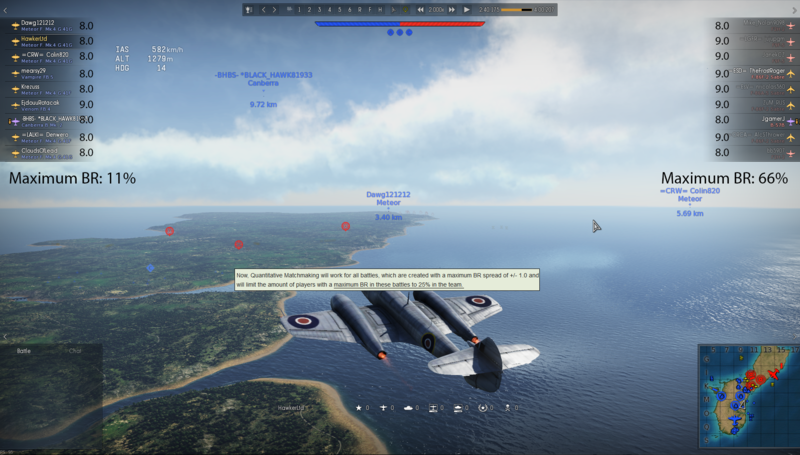 We strive not only to support optimal balance among all vehicles represented in War Thunder, but also to make the balancing mechanic simple and easy to understand for any player. This means that the next logical step in improving our matchmaking mechanism is additional development of a simple and understandable Battle Rating system by making an exception to the limitation rule on ranks. We’ll use some examples to explain this. In the majority of battles, no changes will be apparent – matchmaking will, as ever, be determined based on the Battle Rating of vehicles. However, in rare cases, the game will be a little easier for individual vehicles – both for their owners and for players who encounter them in battle. Let’s take a look at Germany’s aviation tech tree. At the time of writing, the attacker aircraft Hs.129B-3 has a rating of 3.0 in Arcade Battles. According to MM rules, it can fight against vehicles between BR 2.0 and 4.0. Now look at the Battle Rating of the He.112B-0 – it is 2.3 BR. I.e., by matchmaking rules, a meeting between these aircraft is more than possible, and in a duel, the Heinkel fighter would most likely surpass the Henschel bomber – if it weren’t for the rule that previously forbade an encounter between a rank three attacker aircraft and a rank one fighter. What are the results of rescinding the rank limit rule for players? Greater variety of vehicles in battles while maintaining a comfortable balance of power, and in some cases a somewhat faster start to the battle! This will work in all cases – after all, before this rule is rescinded, a very effective vehicle would never encounter an opponent more than one rank higher regardless of how high we take its Battle Rating, this means it would still undeservedly end up among the top selected for battle. Similarly, a less effective vehicle had no chance in encountering other less effective vehicles at lower ranks forcing them instead to meet more powerful machines. Whatever vehicles you choose, in any game mode with any rank - Good luck and have fun! Yes, many players use tanks like they were pillboxes (massive, "armoured" and with cannon) and their only tactic is to go H2H with other tanks. But I am pretty sure it's temporary for all of them, and sooner than later they manage to use their tracks to move around and use advantages of their vehicles :) Polish tanks. I would love to see some 7TP or even TKS but for now, it's hard to say if or when we will see them in WT. Stona_WT, Thanks for reply. Yeah you know Polish people want to see their nation tanks in game :) Probably lots of Russian tanks (as we used T34's and IS's), but it still would be cool. Or perhaps an European tech tree with multiple nations? ( an idea for game developers ;) ). and what about FW190A4 vs Griffon spitifire, or the Era2 BF109F2 (3.3) vs P51D5 (4.3) at era IV that now will met? Just few examples. Already the MM is falling apart due the big problems of compressions. Now this? Please gaijin listen to the community. Ggoddkkiller, Someone still have faith in this game? I lost it ages ago... The only motive i still playing this is that the other plane/tank game is worst; what don't make this one a good one... For now i'm stick with the other company Ships game, maybe someday WT Navy come out and i become surprised! (a good surprise this time i hope). Seems like a very good change. I personally have been waiting for it for quite a while. It will make the Vickers Tempest much more playable. With BR 4.0 and at Rank 4, it got uptiered way too often. Wibox, It means rank limitation be disabled? Yeah but that puts the Tempest against Fw-190 Ds which have a rough time killing them because they outperform them in almost everything. It's hard understand + or - 1.0 it is too much? to understand 1,3 was very very very too much gaijin had more than one year, now how much years to know you loosing a lot of players? Do you ever plan on publicly releasing the global winrates of all vehicles across all modes so we can see the effect of matchmaking systems, changes to BR over patches and which game modes benefit which vehicles? Win rates works like guides for huge amount of players. Imagine FockeWulf with W/L rate at 70% - all players will jump on it and start to play it, then they will fail (FW 190 is not the easiest aircraft to handle) and start to rant/leave game/says that we are lying and W/L stats are fake because they cannot win/shot enemy. Stona_WT, I haven't thought that win rates are that important, it's way too random. I have more concentrated on the kills to battles ratio, which i think is more important, especially in higher BR battles. I think we would all like to see that.